History: (from Wikipedia) Dell’Orto is an Italian company, headquartered in Cabiate, specialized in the construction of carburetors and electronic fuel injection (EFI) systems. The company was founded in 1933 as “Società anonima Gaetano Dell’Orto e figli” (Gaetano Dell’Orto and Sons). Their first products were carburetors that came fitted as standard to new vehicles. Shortly before the second world war they began producing carburetors with aluminum bodies for use in motorcycle racing. At the beginning of the 1960s Dell’Orto was producing OEM carburetors for the Fiat group, as well as other Italian and foreign constructors (i.e.Flandria, Belgium). At the end of the 1980s, under the supervision of Luigi Dell’Orto (son of Gaetano), the company’s first injection systems were released. The company is today one of the worldwide leaders in the field of carburation and is present in the sport field as partner of Gilera that participates in the Road Racing World Championship. 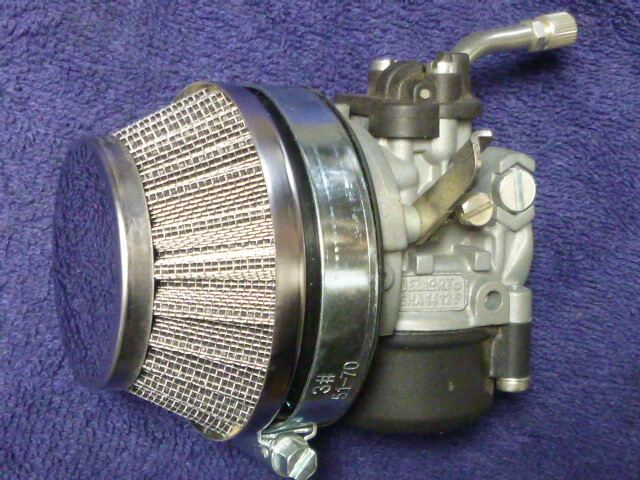 It is also used in every modern Derbi, Aprilia, and Yamaha 50cc model. Dellorto carburetor types: The first few letters of the ID number are the type. Carburetors for each type are made in different sizes and configurations, but look mostly the same and share most of the same parts. 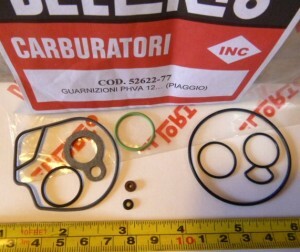 Dellorto threads: Many Dellorto carburetor bodies get ruined or “stripped” by using the wrong screws. 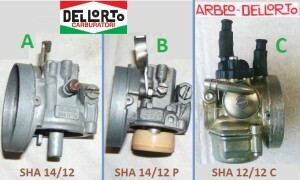 The Dellorto SHA is a family of Italian moped or mini-bike carburetors. SHA’s have flat throttle slides and no jet needles. They all have the same outer size and main body appearance, with a 59mm round flange for an air filter. They have been produced for in Italy from the 1960’s to the 2000’s. In particular the Dellorto SHA 14/12 and 14/9 carburetors were on tens of thousands of US mopeds from 1976 to 1985. The Spanish moped Derbi had Arbeo-Dellorto carburetors, made in Spain under license. They were more goldish colored, and tended to leak fuel past the float seat. Since the 2000’s there are Asian remakes. 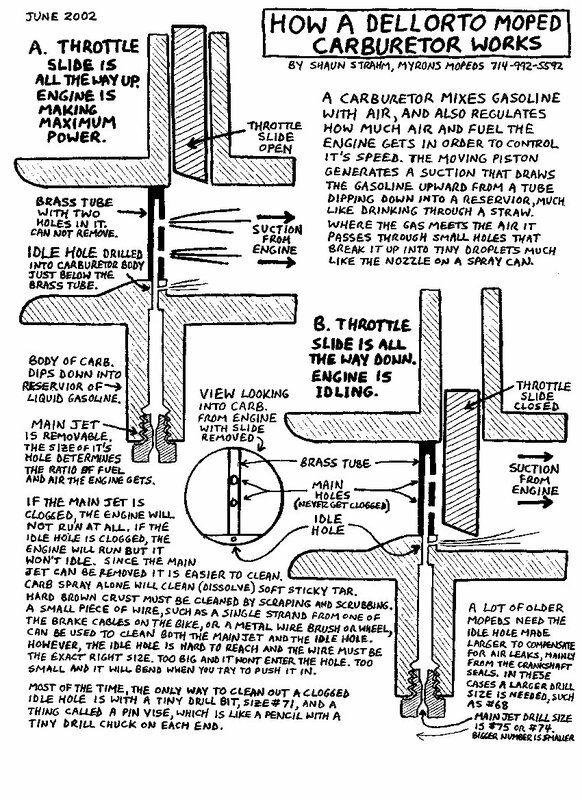 Carburetor Size: The venturi is where the air mixes with gasoline. It is also where the air passage gets narrower, to cause a higher air speed in order to atomize or break up the liquid fuel into smaller droplets. With Dellorto SHA carburetors, two numbers are used to describe the size of the venturi. The first number is the venturi exit, and the second number is the venturi entrance. So looking at an SHA 14/12 from the front you see a 12mm hole, and from the back (engine side) you see a 14mm hole. Cable choke is needed when the carburetor choke lever cannot be reached by hand. Clamp size: These new replacement carburetors only clamp tight when the intake pipe is exactly the right size. Many intakes are made slightly smaller or become smaller from wear. When the clamp screw is tightened fully, the carburetor can still move, and eventually slip off. For a 18 sleeve, a 18.00 to 18.10 pipe would clamp tight, but 17.95 or less pipe would not clamp tight. That is not very much forgiveness. Cut up a can: A strip cut out from an aluminum can, with scissors, can be placed under the sleeve. Thickness is 0.1mm. Either a 1/3 circle or a full circle can be used, as needed. A full circle adds 0.2 to the clamp diameter, for a 17.80 to become 18.00. A 1/3 circle adds 0.1 mm, for a 17.90 to become 18.00. A thin aluminum baking pan is thinner than a can. A thinner full circle is better for when only a little is needed. Most brand new original Garelli, Minarelli, and Tomos intake manifolds (pipes) are 18.00. 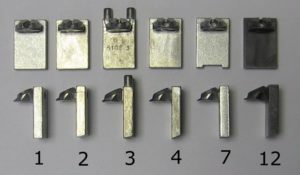 But some are 17.95, and actually need a 1/3 strip of aluminum can inserted in order to clamp tight and proper, with new original carburetors. Thread is M6-0.75. Adjuster is M5-0.75. A throttle cable end can pass through, except 2d. 25 6140-37 $4.00 idle screw M4-0.70 x 25 regular metric ! 56 0-ring56 $1.00 tiny rubber o-ring 3 x 6.5 x 1.75 only for ? 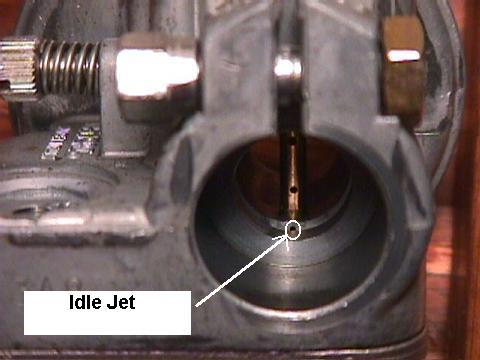 An oil-injection intake has a M6-threaded hole for the oil line. A no-oil injection intake does not. Plug the hole with a M6x8 bolt and M6 seal washer, to convert oil-injection to no oil injection. Choke Sticking On: Often the choke sticks on, for no apparent reason. The throttle cable is sometimes too loose to pull up the choke trigger. More often, the choke trigger lever has become bent or twisted. This happens often because great care must be taken to keep the trigger against the side wall when the top assembly (throttle slide, choke trigger, cover assembly) is installed. Before the top screws are tightened, and with one finger holding the top in proper position, it is wise to test the choke by directly pulling on the throttle wire. It should click off at full throttle. Only then should the screws be gently tightened, while holding the top with that finger. If not, then inspect the trigger lever for misalignment, and re-align carefully with small pliers. Sometimes rounding off the side edges helps the trigger lever to not stick also. The last resort is to replace it, but pushing out the tiny hinge pin is difficult. So it is better to straighten it. Welcome. The Dellorto “SHA Vespa” is like a regular “SHA” but more compact. It has a smaller 50mm air filter flange, not 59. 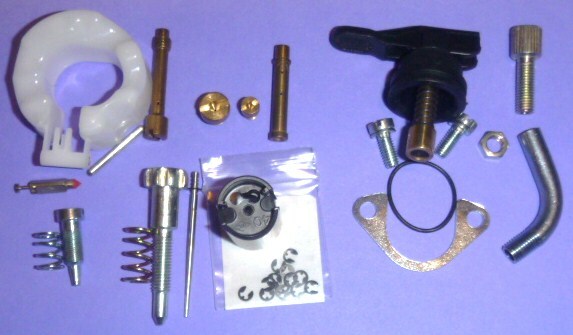 This style of carburetor was original on all Vespa/Piaggio mopeds 1970’s, 1980’s, 1990’s, and 2000’s. In the USA it was on 1972-86 Vespa mopeds, 1983-86 Garelli VIP-N, and mid 1990’s Kinetic TFR mopeds. 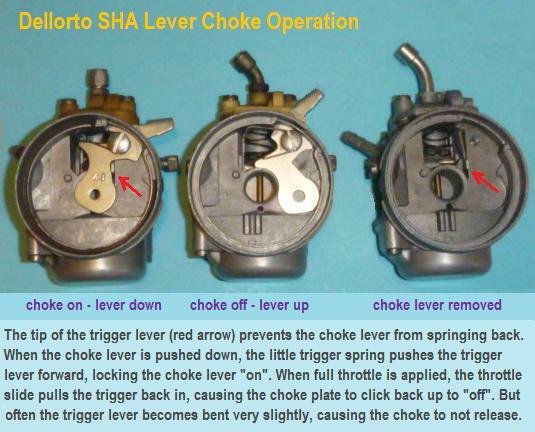 The SHA Vespa carburetor has an improved choke release trigger, that cures the sticking trigger lever problem that the regular early SHA had. Vespa types have a sliding push rod, that moves up a ramp in the throttle slide when the throttle is raised fully. The solid rod pushes the choke lever/plate over a little stop tab. The torsion spring is then free to snap it back off. 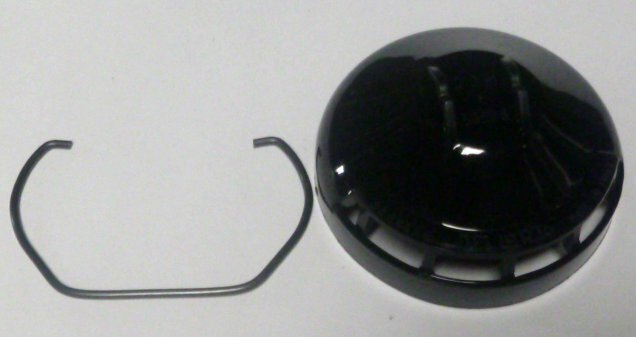 The top is relatively easy to put on, with only the throttle slide and spring to install, no choke device that gets damaged easy, not even a top gasket. There were 3 carb bodies, 7, 10, and 12mm, 5 jet sizes, 39, 41, 43, 45, 49, and 2 air filter boxes, 3-hole and 6-hole. The Boxer had a side-pull carb top assy, like Peugeot. It gives more frame clearance. After 1979 the Boxer became the Si. There were 4 choke levers, Grande, Bravo, Ciao, Boxer. The later Boxer 2 had the linkage type choke with pull wire. There are 3 carb bodies, 7, 10, and 12mm, 4 jets, 39, 42, 45, 49. The Ciao P and Bravo P had top pull, and Si had a side-pull carb top assy. There are 3 choke levers, Bravo-Ciao, and Si, linkage type, and Grande. There are 2 air filter boxes, 3-hole and 6-hole. Some are newer designs. Prices in green are for new, dark green are for used items. 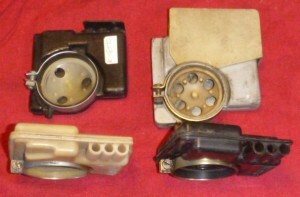 Vespa air filters: L, 3-hole, R, 6-hole. Row 1 covered: L, Kinetic, R, Grande. Thread Size: Dellorto jets in mopeds come in three thread sizes 4, 5, and 6 millimeter. Each thread size has maybe a hundred different jet sizes. 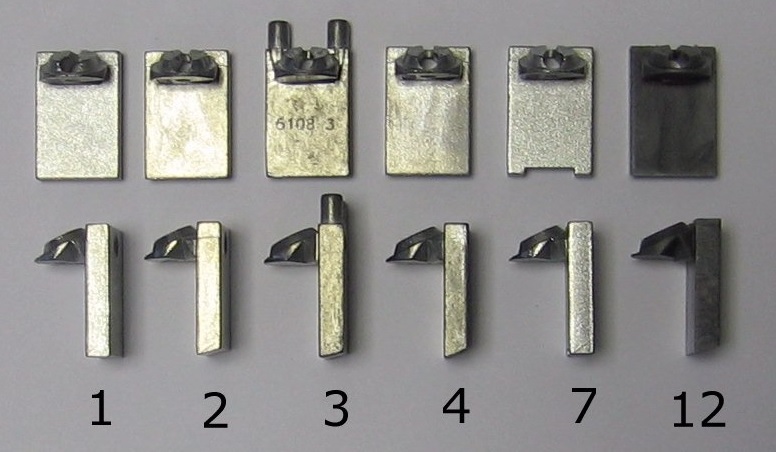 They all fit and look the same but have different size pin holes. Jet Number: Jets have a number stamped on them indicating the hole size. The number can have different meanings for different jet makers. 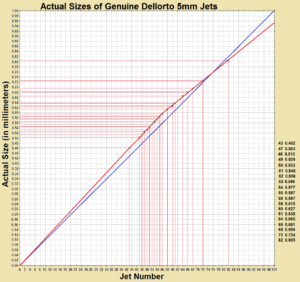 For generic Dellorto jets the jet number is the mm size. A generic Dellorto 60 is 0.600 mm. 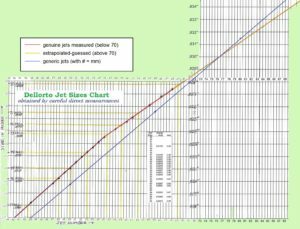 For genuine Dellorto jets the jet number is less than the mm. A genuine Dellorto 60 is 0.627 mm. So a genuine 60 is in-between a generic 62 and 63. This sounds wrong but is true! 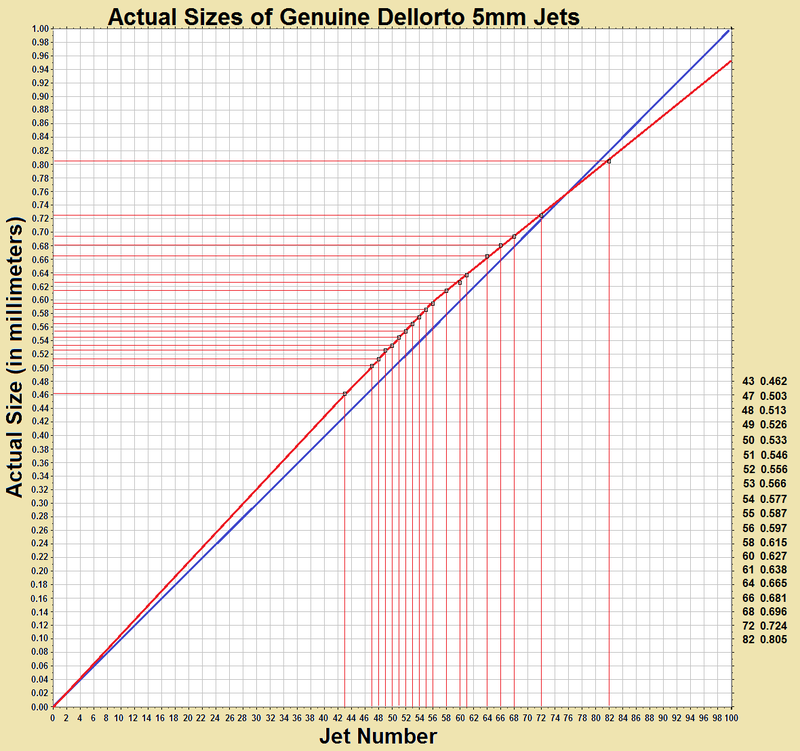 How this was determined: Below is a graph of 17 genuine Dellorto 5mm jets actual sizes. The direct measurement was done with a set of machinists wire gauges, in increments of 0.001″. You can see how the measured sizes fall nicely on two lines. The line for over-56 has less slope than the line for under-56. 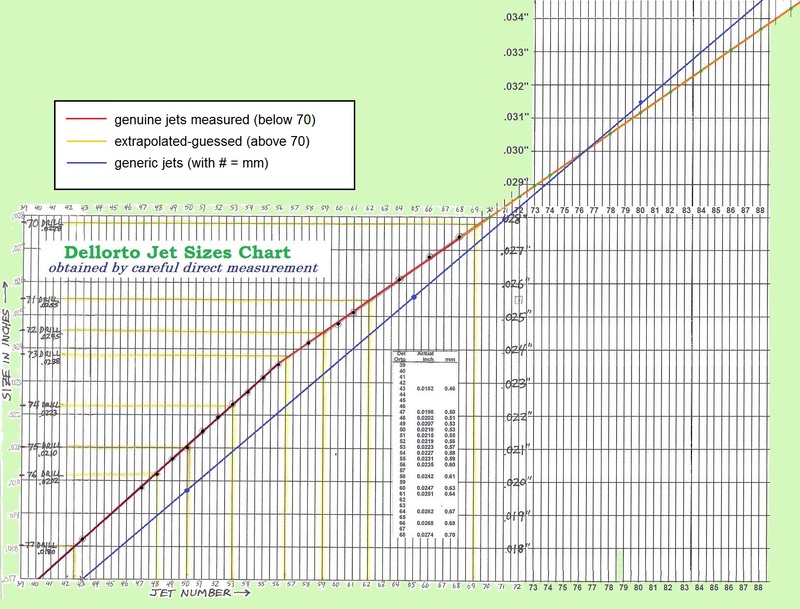 You can also see what drill sizes correspond to what jet sizes. This study was done in 2002 before there were generic jets. It was surprising to learn that the stamped number did not mean the millimeter size. Here is the engine side view of a Delorto SHA carburetor. At the base of the vertical brass “spray tube” with one or two holes in it, there is a tiny hole in the silver metal below the brass. It gets overlooked frequently. When it is blocked, the engine will not stay idling for more than a few seconds, but will otherwise run fine if the throttle is kept open. Welcome. 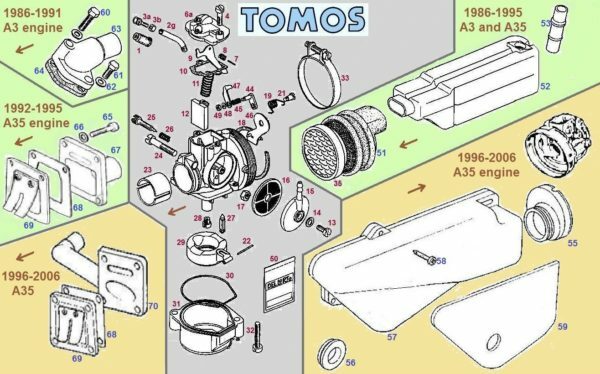 This is a “third generation” Tomos carburetor, on US mopeds. It is preceded by two others, the Encarwi A83 on Tomos A3 1974-85, and the Dellorto SHA 14-12P on Tomos A3 1986-91 and A35 1992-06. 6 The wrong one, paper kind, is shown. Actual Tomos kind is rubber. You are currently browsing the archives for the Dellorto category.